A new group of Chapel PathWays Fellows and Interns were commissioned during the Chapel's Sunday morning worship service on June 12 (watch the video). Ministers Bruce Pucket and Joshua Lazard introduced them and prayed for them. Standing with the Fellows and Interns were representatives of nonprofits at which they will serve. Below are brief biographies of the Fellows and Interns, which include how they will be serving in the community. The PathWays Fellowship is a one-year residential discernment program designed for recently-graduated Duke alumni. 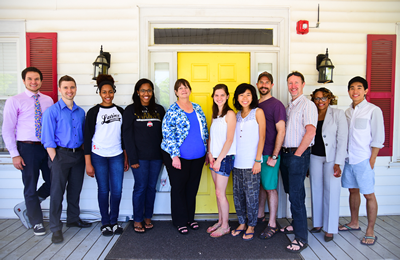 This is the 11th year the PathWays House has been home to students living in the West End neighborhood of Durham. Those living in the house have committed to the PathWays Household Covenant of daily prayer, weekly meals, fellowship, service, and friendship in Durham. Julia is from Baltimore, MD and graduated in May with a degree in Biology. As an undergraduate, she was involved in the Duke Catholic Center, Momentum Dance Company, and the Delta Gamma Fraternity. She is excited to be working with Duke Connected Care this year and further exploring her interest in geriatric medicine as she applies to medical school. Julia is excited to see how the PathWays community will grow in faith and service this year. Amber was born in the Bronx, New York, and grew up in Lawrenceville, Georgia and Olmsted Falls, Ohio. She graduated in May with a degree in English and minors in Spanish and Political Science. During her undergraduate career, Amber was involved with United in Praise Gospel Choir and the Duke Catholic Center. This year, she is most looking forward to serving with World Relief Durham, a refugee resettlement agency with a mission to empower the local church to serve the most vulnerable. In the future, Amber hopes to obtain a law degree and pursue a career combining work in human rights and child advocacy. She is especially thankful for the opportunity to discern spiritual and vocational direction as she seeks God throughout this season. Chrislyn hails from Princeton, NJ, and Penang, Malaysia. With a BS in Neuroscience and Certificate in the Arts of the Moving Image, she enjoys applying insights from neuroscience and film to communication in business, education, and personal development. Chrislyn loves a good story and treasures every narrative as an invitation to know and be known. She came to this realization through a documentary DukeEngage program in Medellín, Colombia, and a video production internship with 2100 Productions (InterVarsity Christian Fellowship/USA). She is also grateful to her communities in Something Borrowed Something Blue (Duke’s Christian a cappella group) and the Brownstone Selective Living Group. Through PathWays, Chrislyn is thrilled to continue living in community and growing as a Storycrafting Apprentice with StoryDriven, a documentary-style marketing team. Marleen was born on the beautiful island of Puerto Rico and grew up in New Bedford, MA. She recently graduated with a BS in Psychology and minors in Chemistry and Biology. While at Duke, she was involved with United in Praise gospel choir and was a member of Adventist Christian Fellowship. During her time as a Fellow, she looks forward to working with El Futuro, a non-profit in downtown Durham that provides mental health services to Latinos in the community. Chris graduated from Duke with a double major in English Literature and History and a minor in Cultural Anthropology. He grew up in Queens, NY, and Schaumburg, IL, before spending the last eight years in NC. After working/studying abroad in five different continents during college, he is happy to settle into Durham as a resident of the city that has given him so much. He will spend the year working at StepUp Durham, as well as rediscovering his love for old hobbies such as drawing, running, and learning languages. He is grateful to Pathways for giving him the time and space to reflect upon God’s voice before he applies to law school. The PathWays Summer Internship is designed for Duke undergraduates interested in exploring their calling as Christians while living in community in the Isaiah House, an intentional Christian community focused on hospitality in East Durham, and through employment in Durham nonprofit, government, faith-based, and ministry settings. The internship lasts eight weeks (June-July) and includes daily morning prayer, weekly discernment dinners, theological writing and reflection, service opportunities, and a mid-summer retreat. Addie is a rising senior from Westford, Massachusetts. She is a pre-medical student with a biology major and chemistry minor. She is an active member of Duke’s CRU ministry and the Duke alpine ski and sailing teams. This summer she is looking forward to working with Duke Hospice and Homecare, where she will visit patients as well as help to organize the Durham chapter of the “Being Mortal Project,” a nationwide public awareness campaign on the importance of talking about end-of-life preferences and goals with loved ones and medical professionals. Jihwan Hwang is a rising junior from South Korea majoring in chemistry with a concentration in pharmacology. He is interested in discovering new connections between science and human health. This summer, he is excited to intern with Duke Community Health, where he will explore and help inform the public about various community health resources. Jonathan was born in Sacramento, CA and raised in the small city of Casa Grande, AZ. He is currently a rising junior working toward a degree in Public Policy, an Economics minor, and a Certificate in Markets and Management. This summer, he is ecstatic to be working with Community Empowerment Fund (CEF), a student powered nonprofit that works to encourage financial independence for financially disadvantaged members of the Durham and Chapel Hill communities through relationship-based support, financial coaching and financial literacy training.